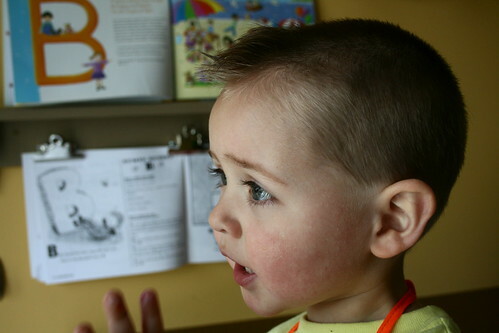 Caleb is 2 1/2 (31 months old) and he has a new haircut. I was inspired by the worship leader at our church, Dan Holst, for this little cut. I think it makes Caleb look like a really hip bully. I thought I’d take a few moments to note what he’s doing these days. Recently, we were at Key’s Cafe for lunch. Caleb’s food came and he said, “Hey, no french fries. Mama, you have any french fries?” I said that no, I didn’t have any. He turned to Grandma Whiting, “Grandma, do you have any french fries?” Grandma said that no, she didn’t have any. She suggested that he enjoy his hashed browns because they were kind of like french fries. Then, Caleb stands up in the booth and turns to address the entire restaurant, “Hey! Anybody have any french fries?” We explained to him that we couldn’t bother other people at the restaurant, which he seemed to think was pretty lame. Hilarious all the same. We recently took him to a jazz concert at Bethel University. I was pretty impressed that he was able to sit through the whole thing (2 hours!). He would clap along, try to snap, impersonate the strange foot-stamping of the director, and ask questions about the instruments. Aside from a shout of “Good job everybody!” and “Oh! Duke Elliston!” (Duke Ellington), he was actually very well behaved. He also struck up a conversation a few times with a blonde female vocalist. What can we say? Caleb digs his jazz. Caleb: Mama, what are we doing today? Me: I don’t know, what do you think we should do? Caleb: Hmmm… maybe go to the park. Or maybe we should just stay home and make some waffles and sausage meat. I would like to watch Mary Poppins too because the penguins are so funny, HA HA! Silly penguins. Me: Waffles sound delicious! We should go outside too. Caleb: Oh yes. I think… today is the day for the garbage truck. Me: That’s right. The garbage truck is coming today. How did you know that? Caleb: Oh, I see the cans outside. The truck goes up and down with the garbage cans and then we can bring ’em back. Me: Oh, will you help me bring the cans back to the house? Caleb: Yes. And let’s bring Ella too. And my drum. Me: Ha ha, the side of the garbage truck says, “It’s rubbish!” That’s too funny. Me: It’s another word for garbage. Garbage is rubbish. Rubbish is garbage. We’ve started to try to play board games, but they are still pretty complicated for him. He enjoys the lame paired-down version of the rules we play. He loves his marble run and enjoys “engineering” new runs. He loves to count and even does simple math on his own (like adding and subtracting birds as they land in or leave our yard). 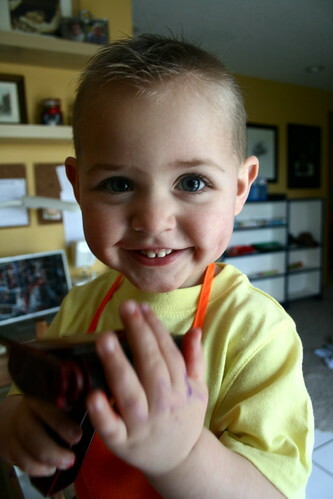 He really loves music and continues with Musikgarten and has recently been asking to play the violin. His pitch is improving. We paint a lot. He mostly enjoys gluing things, so I gave him a container of things he can glue to paper and he’ll do that for awhile. He likes to help feed Jack his baby food. Caleb also enjoys helping around the house as usual. He loves to talk to people. He is getting better at controlling his emotions (meaning that he flings himself on the floor less often). We love seeing his personality develop!